Drive Hydraulic Deluxe Silver Vein Patient Lift with Six Point Cradle features 6 point Swivel Bar that can accommodate 2 or 4 sling straps plus 2 chain connections. High-performance hydraulics raise or lower individuals gradually and safely from any stationary position. It has adjustable width base and silver vein steel construction. Buy this product and earn 28.5 Reward Dollars. - Check all parts for shipping damage before using. In case of damage, do NOT use the equipment. Contact the Dealer for further instructions. - The Drive patient lift is NOT a transport device. It is intended to transfer an individual from one resting surface to another (such as a bed to a wheelchair). - Moving a person suspended in a sling over ANY distance is NOT recommended. - DO NOT attempt any transfer without approval of the patients physician, nurse or medical attendant. - Thoroughly read the instructions in this Owners Manual, observe a trained team of experts perform the lifting procedures and then perform the entire lift procedure several times with proper supervision and a capable individual acting as a patient. - Special care MUST BE taken with physically challenged individuals who cannot cooperate while being lifted. - Use restraint straps if necessary. Drive slings and patient lift accessories are specifically designed to be used in conjunction with Drive patient lifts. - Slings and accessories designed by other manufacturers are not to be utilized as a component of Drives patient lift system. - Use of these products is prohibited and will void Drives patient lift warranty. - Use only genuine Drive slings and lift accessories to maintain patient safety and product utility. - Use a sling that is recommended by the individuals doctor, nurse or medical attendant for the comfort and safety of the individual being lifted. - DO NOT use any kind of plastic back incontinence pad or seating cushion between the patient and sling material that may cause the patient to slide out of the sling during a transfer. - When using an adjustable base lift, the legs MUST BE in the maximum OPENED/LOCKED position BEFORE lifting the patient. - Before transferring a patient from a stationary object (wheelchair, commode or bed), slightly raise the patient off the stationary object and check all sling hardware for secure attachment to include swivel bar, straps, S-hooks and D or O-rings. - During transfer, with patient suspended in a sling attached to the lift, DO NOT roll caster base over objects such as carpets, raised carpet bindings, door frames, or any uneven surfaces or obstacles that would create an imbalance of the patient lift and could cause the patient lift to tip over. 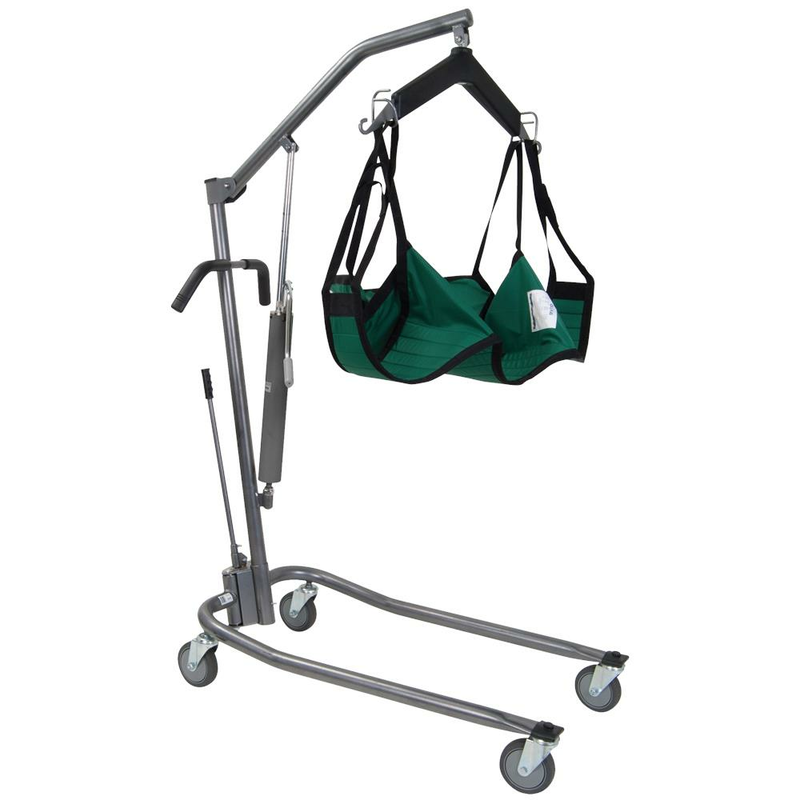 - Use steering handles on the mast at ALL times to push or pull the patient lift. - After the first 12 months of operation, inspect the swivel bar and the boom (to which it attaches) for wear. If the metal is worn, the parts MUST be replaced. Make this inspection every three (3) months thereafter. - The hydraulic pump is sealed at the factory and if service is required, the pump unit MUST BE returned to the factory for repair. - DO NOT attempt to open the hydraulic pump or obtain local service as this will VOID the warranty and may result in damage and a costly repair. - Consult your Dealer or Drive for further information. - Casters and axle bolts require inspection every six (6) months to check for tightness and wear. - Regular maintenance of the patient lift and accessories is necessary to assure proper operation. - DO NOT exceed maximum weight limitation of the patient lift. These suggested weight limitations will vary from 300 to 450 Ibs. depending on the type of patient lift purchased.